The ultimate in portability and durability! Our best Dual Post System is Designed for easy setup and on-the-fly adjustment in applications such as open fires, campfires, and free standing fire pits. 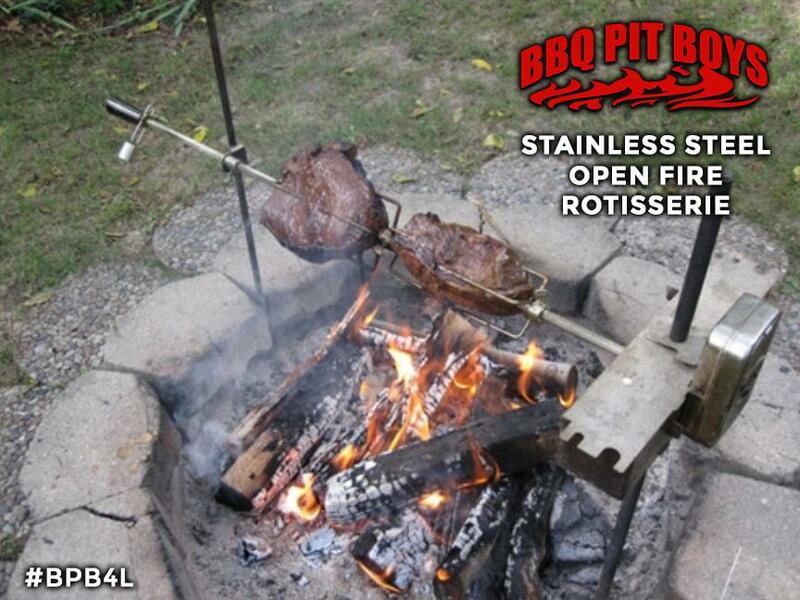 We used to sell the Auspit Rotisserie here at our store, but that manufacturer no longer has the product available so we teamed up with another vendor with the closest thing to the Auspit... this is the PREMIUM version! 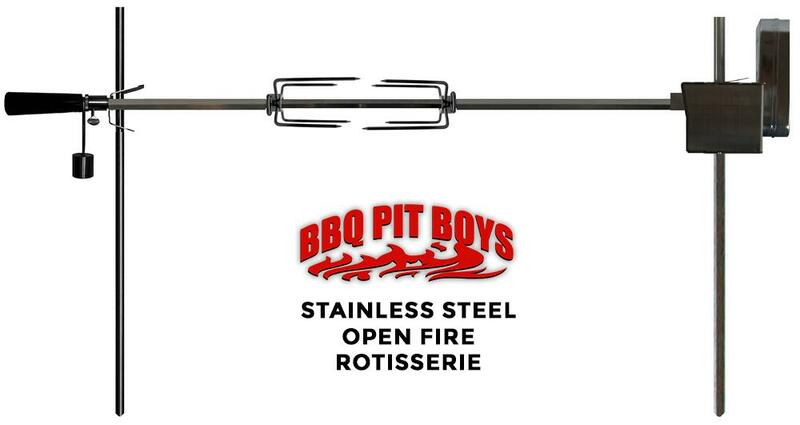 The All Stainless Steel Cordless Open Fire Rotisserie System addresses all key areas of what can otherwise be a frustrating experience. Featuring solid 304 stainless steel support posts and our most rigid 304 stainless steel motor support mount, this system provides users with not only the most sturdy system available, but also a lifetime of guaranteed rustproof performance. With the exception of the motor this system is entirely impervious to all weather conditions. With tool-less infinite height adjustment you can easily, safely, and effectively change the cooking height as needed and without the fear of collapse; even during the cooking process, with the squeeze of your thumb. This kit comes complete with the top rated cordless motor capable of turning a 20 pound load for a duration of up to 36 hours per set of batteries. 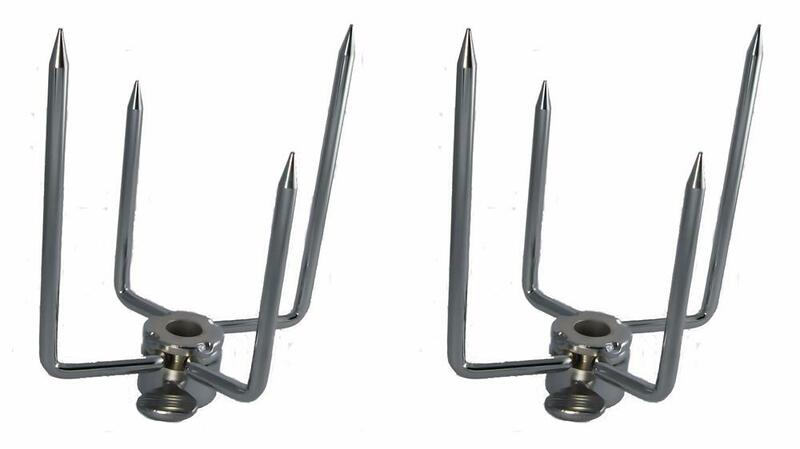 With a heavy gauge 1/2 inch hexagon profile 304 stainless steel rotisserie spit rod and rugged offset four prong rotisserie spit rod forks bowing and floppiness generally associated with lower quality kits is nonexistent. The inclusion of an adjustable bushing allows this kit to width adjustable for a perfect fit to your application. To further ease the cooking process and aid in load balancing a fully adjustable 304 stainless steel counterbalance system is included. A premium heat resistant handle provides a safe and secure measure for loading and unloading the desired load. 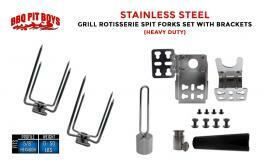 This kit is designed to work with spans up to 39" wide. Designed for ground engaging applications such as open fires, campfires, and free standing fire pits. Top rated cordless motor provides up to 36 hours of continuous use on a single set of batteries. Durable 304 stainless steel premium grill head and outboard support clamp allow for tool-less, easy infinite height and directional adjustment; even while cooking. 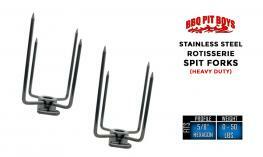 Premium grill head features increased clamping rigidity, integrated tool hangers, and can be expanded for usage with cooking grates and griddles with grill head arms (grill head arms sold separately, please email BBQ Pit Boys Fan Shop Customer Service for help there). Durable 304 stainless steel support post are designed for easy ground engagement and lifetime of rust-proof functionality. Includes 304 stainless steel 45" X 1/2" spit rod, forks, counterbalance and bushing for a lifetime of rugged performance. If you need a set-up guide PDF or additional fitment information, contact John at [email protected] with your questions.